Apple confirmed that the iPhone 2.0.2 update does indeed include changes to address issues related to 3G reception. USAToday cited company spokesperson Jennifer Bowcock as saying, "The software update improves communication with 3G networks." The newspaper referenced reports of complaints from iPhone users and cited speculation about possible hardware issues with Infineon chips used in the iPhone, a possibility Infineon itself earlier discounted as unlikely, noting that other phone makers use the same components without any issues. The report also cited Jupitermedia's vice president for mobile strategy Michael Gartenberg, who said the reports of iPhone 3G problems may be overblown. "We've seen these isolated reports about people having connectivity issues with 3G and Edge, and frankly I have those issues on a variety of phones. Cellphone coverage is tricky." The 2.0.2 update apparently addresses complex issues that control how quickly the iPhone 3G will drop a weak 3G signal in order to use a stronger EDGE signal when it is available. In the US, much of AT&T's cellular network is built out using cell towers optimized to deliver "2.75 G" GSM/EDGE service. Sources familiar with the matter say 3G networks require closer tower spacing to provide the same level of coverage with the more modern 3G UMTS. There is nothing Apple can do in software to fill in spotty coverage in AT&T's 3G network, but software updates can adjust how the phone hardware works to allow it find and maintain a link with a less than optimal 3G signal. Independent tests have suggested that at least some versions of the iPhone 3G are too quick to drop a marginal 3G signal that other UMTS phones can use without problems. A CNet report on iPhone 3G issues cited Andrew Seybold, an independent industry analyst, as saying, "My belief is that because AT&T's network is not built out to every cell site, people are getting frustrated because they're finding places where the 3G signal isn't available or is weak." 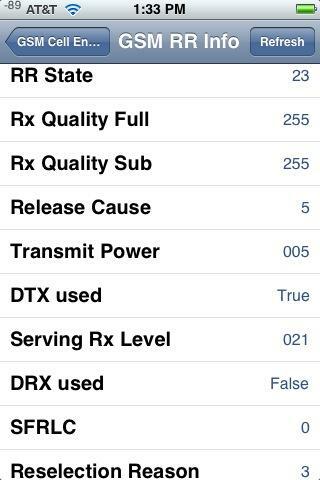 The dizzying array of complexity exposed in the iPhone's Field Test mode (below), entered by dialing *3001#12345#* and exited by hitting the home key, illustrates that signal reception is not a simple matter. For some users, adjustments in how the iPhone 3G's low level radios are configured may provide a usable improvement in 3G reception, while for users in other areas with more signal problems, it may result in futile attempts to cling to a terrible 3G signal that reduces the overall call quality and may be more likely to result in a dropped call. In Japan and parts of Europe, EDGE network upgrades were skipped entirely and providers simply jumped from 2G to full 3G networks. This may impact how much improvement iPhone 3G users see there, as the challenges of finding a strong 3G signal and the firmware's decisions on when to drop down to a 2G signal will simply be different. In the US, AT&T users' experiences with the update may also fluctuate due to the quality and coverage of the 3G network in their area. Steve Jobs separately emailed one user with a tersely worded intent to fix unrelated problems in the iPhone's higher level software that concern instability and crashing in third party apps, writing, "This is a known iPhone bug that is being fixed in the next software update in September."